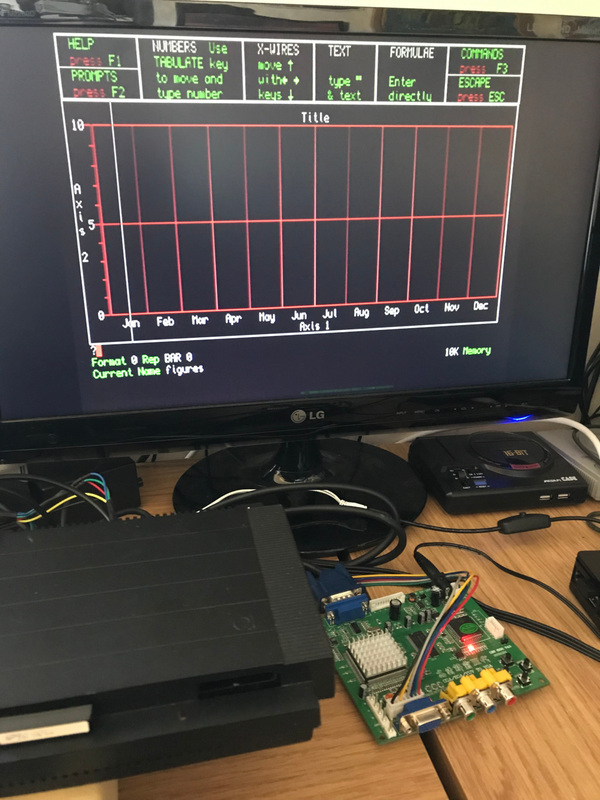 This project initially started life as a way of getting the Monitor 80 column mode of my Sinclair QL working on a modern display. It eventually transformed into a way of connecting nearly all of my retro computers and consoles to my 1080p monitor with a lovely crystal clear display. I now use this to upscale all my retro machines with the only real downside being that it doesn't cover the retro machines that only have composite or RF out, but you can't have everything. 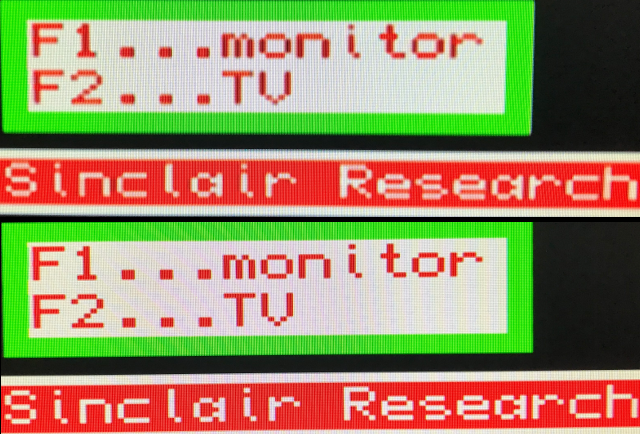 Having owned a couple of Sinclair QLs for a while I've always wanted to try the 80 coloumn Monitor mode but never had a suitable monitor. I've used the easily available SCART cable to connect it to my LCD TV, which works great, but when selecting Monitor mode it cuts off the sides of the screen so is unusable. 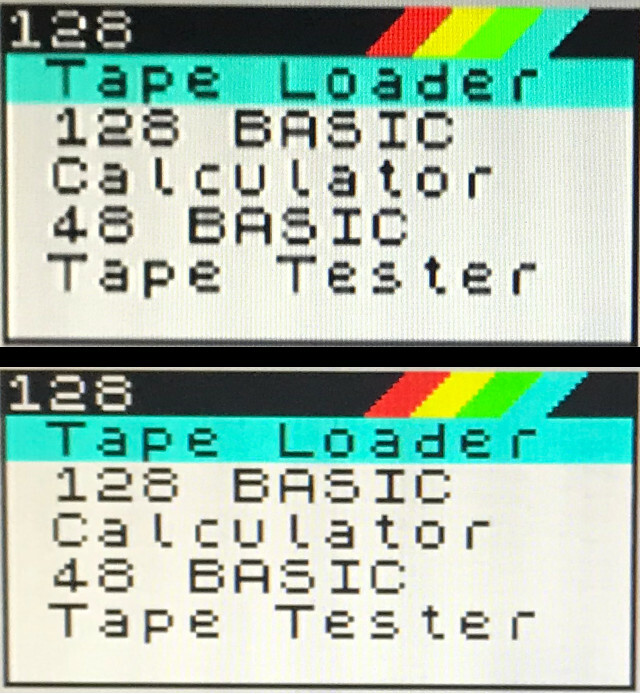 I read on the QL forum that the reason for this is that the QL is expecting a non-standard fast beam return monitor and therefore just won't work with modern screens. 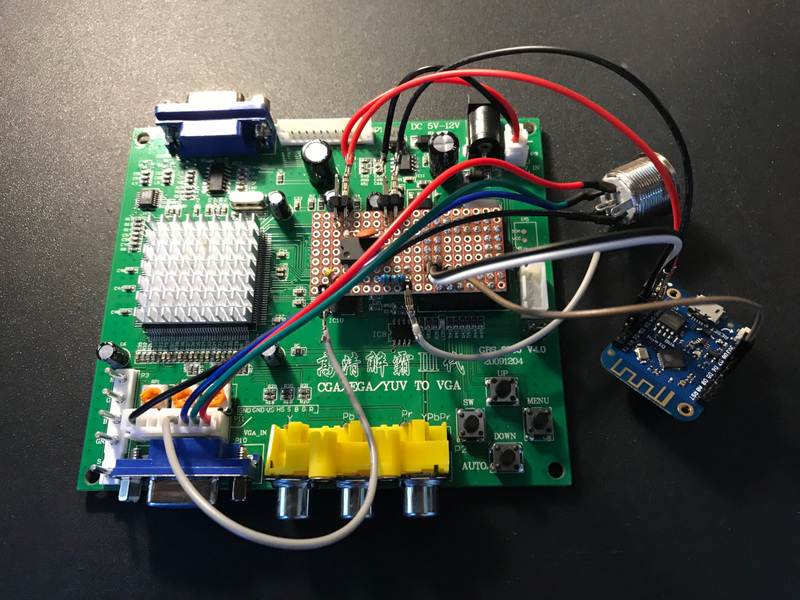 The GBS-8200 is a low cost (~£15) 24-bit A/D RGB-VGA converter used to convert such things as 15KHz CGA for use with modern displays. It has sockets for component YUV, VGA, on-board headers for RGBS & RGBHV and requires a 5-12V power input. From the factory it outputs VGA at either 640x480, 800x600, 1024x768 or 1360x768 and has controls to position and resize the image. The output is also at 60Hz NTSC which, although not ideal, shouldn't be an issue for modern displays. 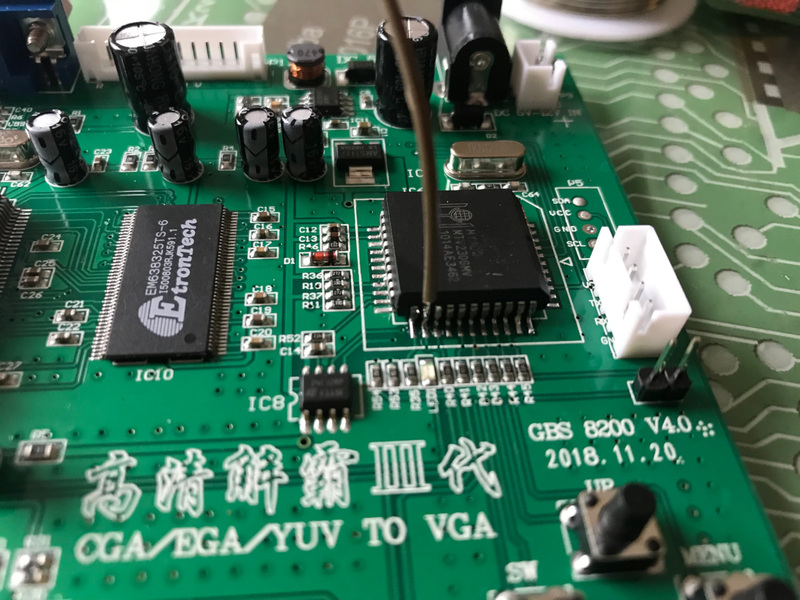 I purchased a v4.0 board from eBay as I read it has the least issues (v5.0 & the dual VGA output 8220s have an LDO oscillation problem) and also seemed to be the easiest to get hold of. The board came with two connectors, one for the 8pin RGBS header and the other for the power input. 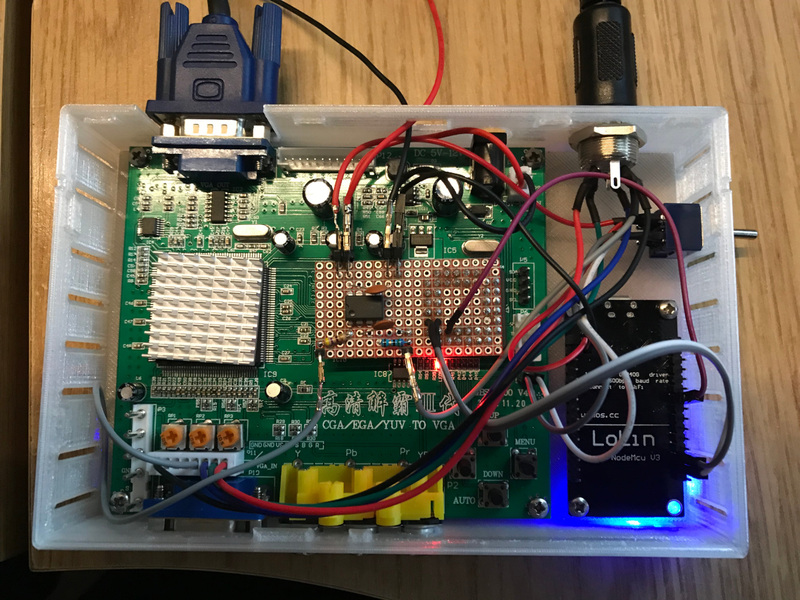 As it came with the appropriate connector I decided to use it to get the QL output into the GBS-8200 and also to power the board via USB to save me having to dig out a 5V PSU with a jack output. For power I initially used a 5V power adapter with jack plug but eventually opted for USB as it was easier. To create a USB power wire I simply cut one end off a USB cable keeping the type A end. 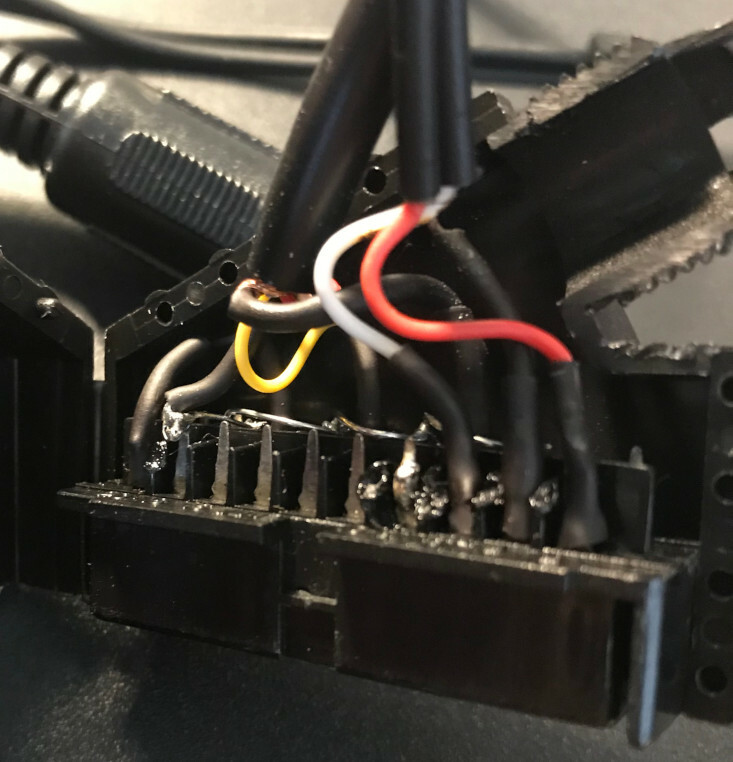 I then jut soldered the red & black wires from the supplied cable to the appropriate wires from the USB cable with a bit of heat shrink for protection. This gave me a cheap and reliable power source. The board doesn't draw much power (only 0.4A) so an iPhone charger seems to work fine. I'd recommend a good 2A charger though, especially if you use some of the add-on boards discussed later, avoid the cheap Chinese ones. Powering up I was pleased to see that without changing anything I got a display at 640x480 and although it was not 100% stable (occasional flickering/loss of sync) and the colours were very washed out I was pleasantly surprised. I replaced the RGB resistors with 68Ω and the colours looked a little better and also replaced the sync resistor with 1KΩ to get the image to be stable at all resolutions. Monitor mode worked as well after some tweaking of the H & V scaling to get it all to fit. 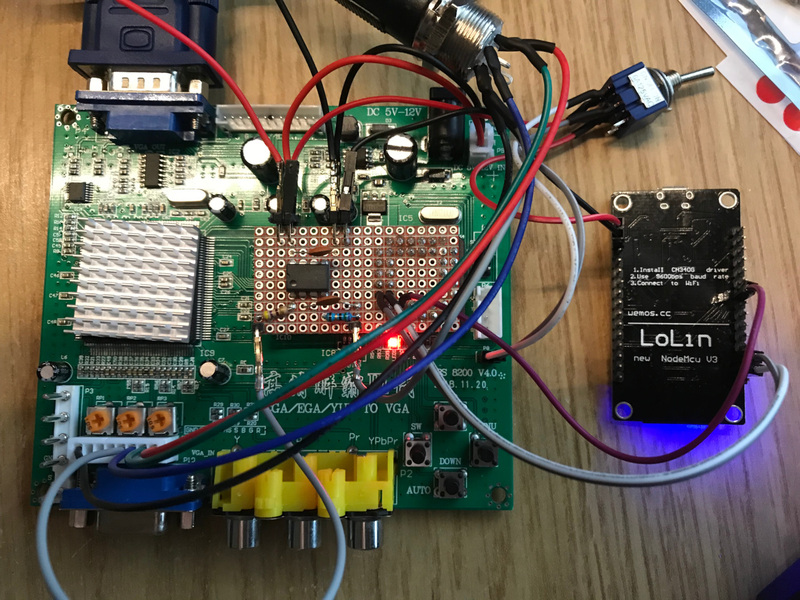 Further reading of the Forums I saw a few mentions of building a simple Sync Splitter circuit to improve image stability as the circuit would clean up the sync output. 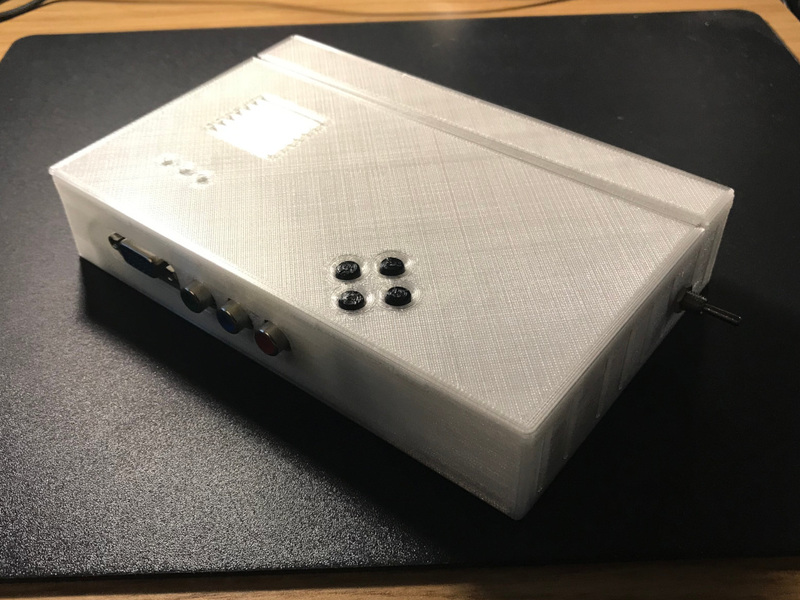 It would also allow the GBS-8200 to be used with more retro computers and consoles in particular those that don't have dedicated composite sync output (just a composite video out). The circuit in question used the LM1881N Video Sync Separator chip. 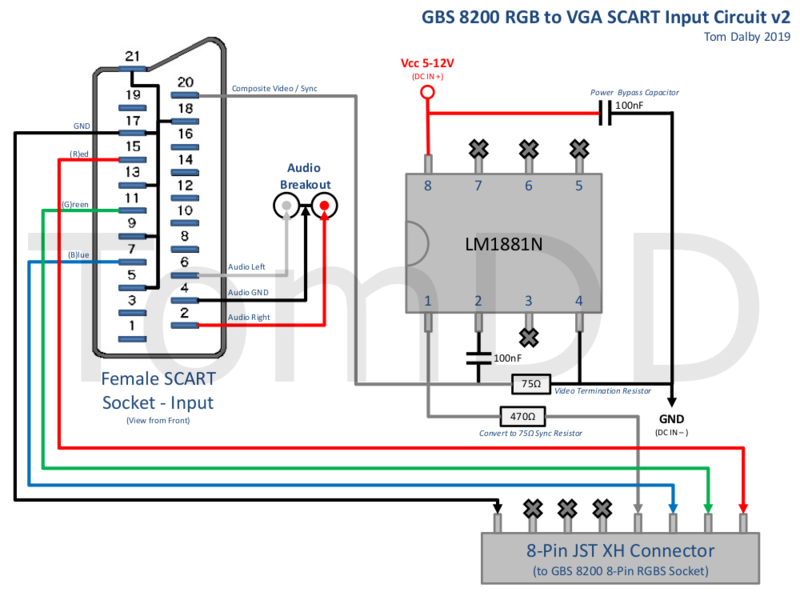 I built the reference circuit as described in the technical specs and connected the GBS-8200 sync line to pin 1 and the output from the QL/BBC to pin 2. 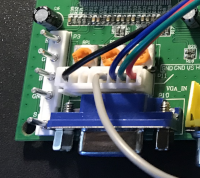 In order to fully test this new circuit I adapted the 6pin DIN input so that it now connected to a SCART female socket allowing me to use this with and test multiple machines, including the QL, via the many SCART cables I had already purchased. 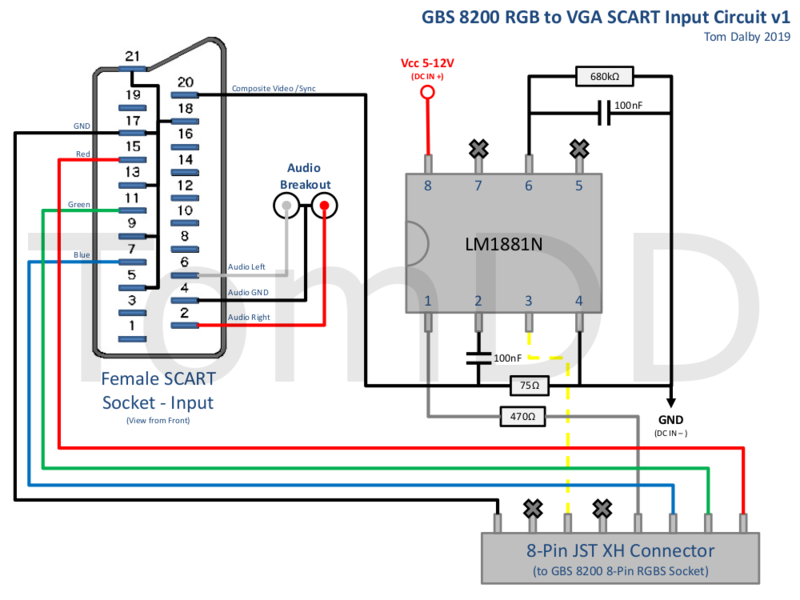 I figured that the shop bought SCART cables already contained the correct resistors and extra circuitry needed to get the RGB & S signals to the correct levels saving me having to build multiple custom cables. 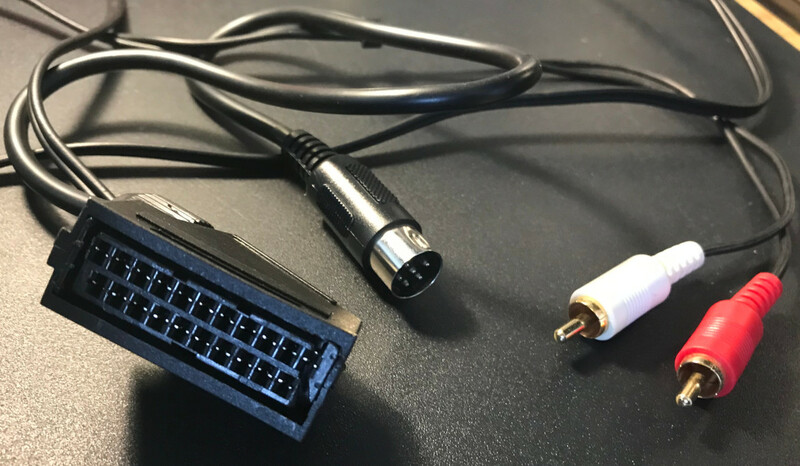 In addition I could extract the audio and some of the connectors for the retro machines are difficult to source such as the one for the Atari ST and Sega Saturn. 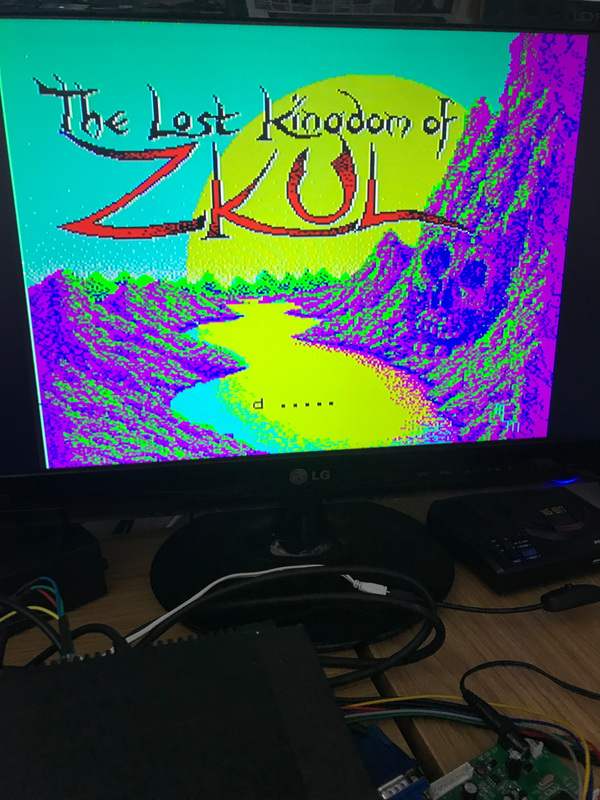 Initially I saw very little difference in the output and in fact found the image to be strangely less stable than before, although I was now able to use the GBS-8200 with other retro machines such as the Sinclair ZX Spectrum 128k which has dedicated circuitry in the SCART cable to add a bright signal to the RGB output. A little more investigating pointed me towards adding a 75Ω resistor from the input pin to ground and a 470Ω resistor between the Sync output (pin 1) and the GBS-8200 board, and this really improved stability. The following diagram shows my v1 circuit. 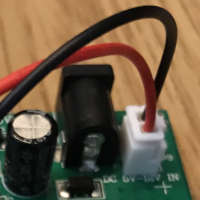 I further refined the design by removing the Rset circuit as this was only used for the V-Sync output, which I don't use, and also adding a 100nF power bypass capacitor as discussed here and here. The only other change I made was to twist the three pots above the RGBS connector as far to left as they would go to get the best brightest RGB colours. Below is my final v2 circuit. Although happy with the v2 design the output is far from perfect. 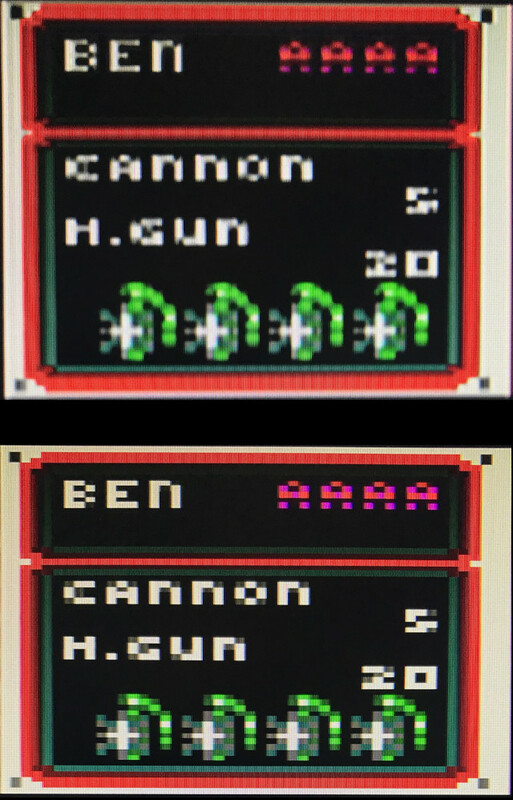 The 50Hz output from all my PAL machines is being shown at 60Hz which creates some minor stuttering (very difficult to notice to be honest) and the maximum resolution of the board is 1366x768 which isn't very crisp on modern displays which are most likely 1080p or above. While experimenting above I came across the CFW project gbs-control by ramapcsx2. 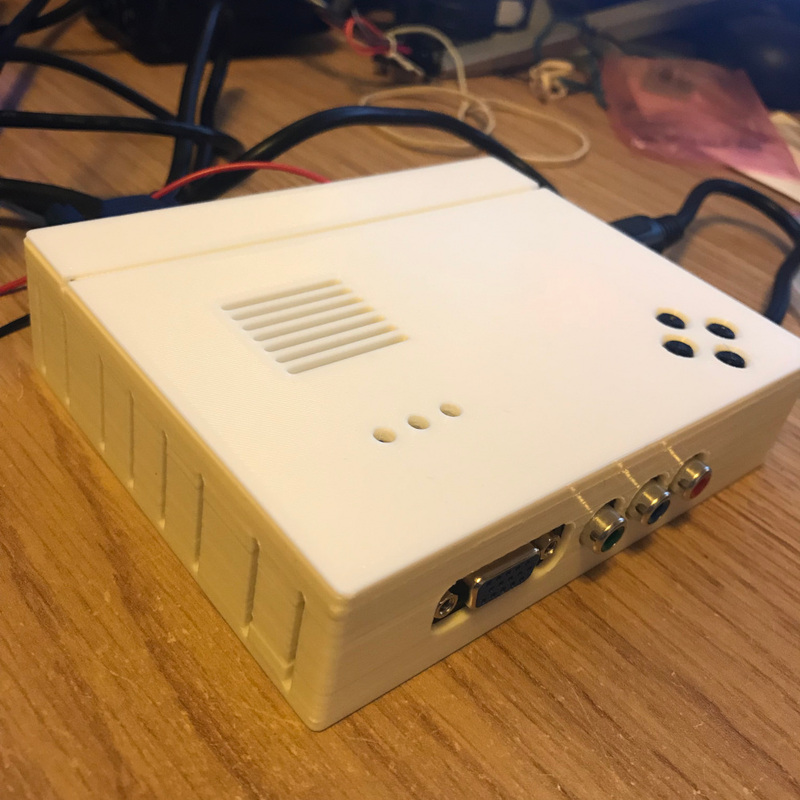 I had heard very good things about it especially if using PAL machines so using my 2nd GBS-8200 board I purchased the extra components as detailed on the wiki set-up guide. 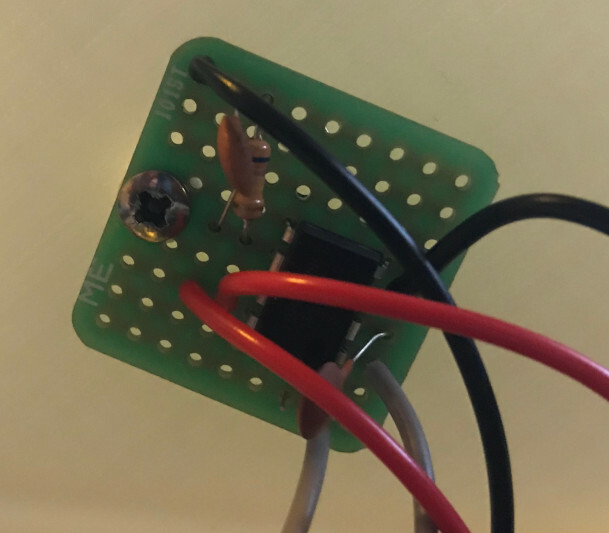 I went with a NodeMCU v3 ESP8266 board which I got on eBay and initially just wired the board up by adding a header to the p5 plug on the GBS-8200 board and adding a wire to the Debug pin of IC6 as shown in the wiki and this photo. I downloaded the Arduino IDE v1.9.0beta, the latest version of gbs-control and flashed the NodeMCU as per the instructions on the wiki. I also set-up the wifi and connected it all up to the GBS-8220. 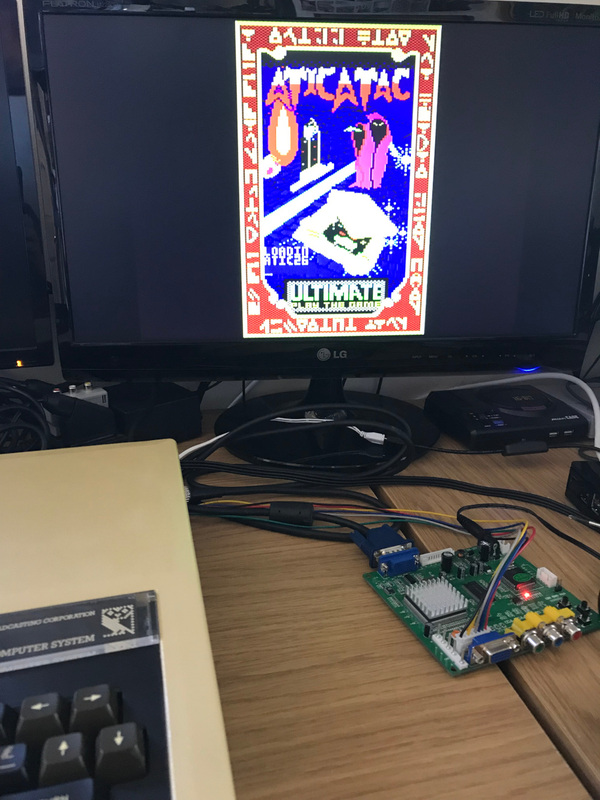 Upon powering up I was amazed at how clear the picture was and with a little tweaking via the web interface (http://gbscontrol.local/) I was able to get a crystal clear 1080p image on my monitor on all the systems I tested including Amstrad CPC, ZX Spectrum 128k, +2 & +3, BBC Micro & Sinclair QL. 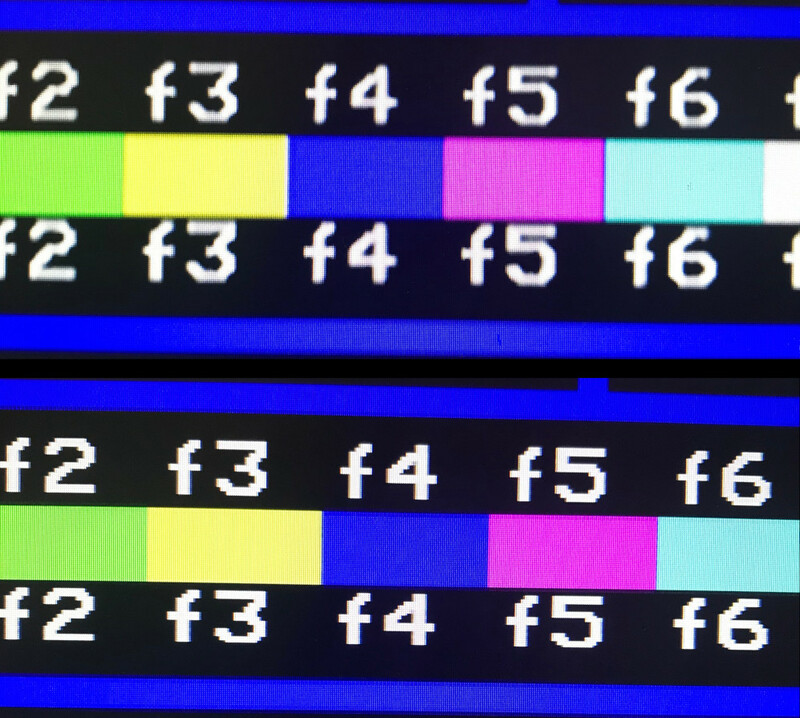 The following pictures show comparisons between the normal GBS-8200 (top) & the CFW at 1080p (bottom). 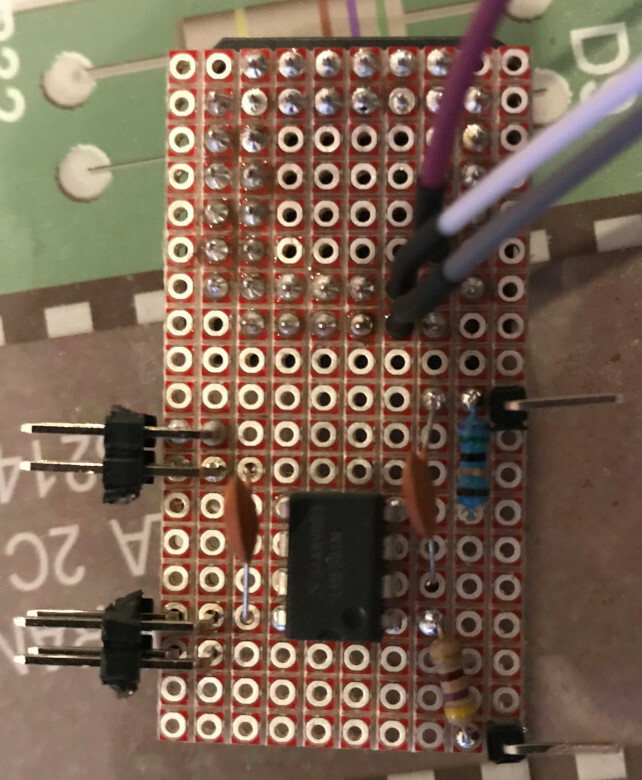 To make the CFW permanent I adapted the circuit using a 44pin chip socket mounted on a piece of PCB prototype board so I didn't need to have a flimsy wire on the debug pin. I also used this board to mount the sync-splitter circuit so it wasn't floating about in the case. Finally I added a small switch so I could disable the CFW if needed by cutting the power to the NodeMCU daughter board and also opening the jumper on the GBS-8200 which is normally closed to enable the CFW. Again a lot of the details are on the gbs-control wiki and some pictures of my circuit are below. As per the standard set-up I've also made a custom case to mount this all in, you can download it from Thingiverse. I also tried the smaller WEMOS D1 Mini instead of the NodeMCU and found it worked exactly the same but obviously a lot smaller which may suite some builds/cases better. Although the output is very good from the CFW adapted GBS-8200 and I will use it daily for nearly all my retro machines, it does have one draw back. 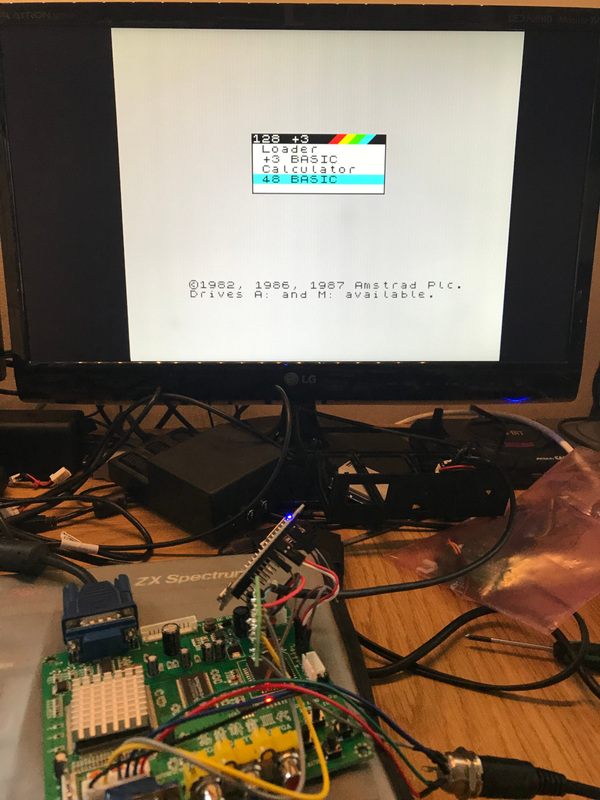 I originally set out to get the Monitor mode working for the Sinclair QL. The base GBS-8200 works fine for this, however, with the CFW installed the output is unfortunately slightly cropped on the right hand side. No amount of tweaking the settings has fixed this for me, although I will explore other options such as adjusting the Arduino code. As such to get full Monitor mode I have to disable the CFW, hence why I added the switch detailed above. The picture below shows the comparison between the two versions, with the CFW at the bottom.